Yes, we know what you’re thinking – what the heck are they? While we’re certainly used to the weird and wonderful here at Oreo and Friends, Sherman and Tootsie the three-banded armadillos really do take the biscuit. But while they may not be the softest or furriest of Oreo’s friends, we’re sure they’ll still capture your heart. Humans may sometimes seem like big, imposing characters to small animals – but there’s no scaring these guys, because they’re quite literally built like tanks! No, they won’t start firing on you from rotating turrets mounted on their backs – they’re built like tanks because most of their bodies are covered with armoured plating! You may think that it would be difficult to get around if you were wearing heavy armour all the time, but Sherman and Tootsie’s plating is banded, so that it can separate and move freely alongside their bodies. Plus, they aren’t really ‘wearing’ armour – it’s made of bone and is as much a part of them as our skin is a part of us. So no, they can’t take it off if they get hot! In fact, if you were to look underneath Sherman and Tootsie, you’d see that the plating doesn’t even go all the way around their bodies – there’s nothing but skin and fur under there! Three-banded armadillos actually have a pretty nifty defence mechanism in the wild. If you were to frighten Sherman or Tootsie (although it’s quite difficult to frighten a tank) they would instantly flex their plating and each roll up into a tiny ball. This way, they know that their entire body is protected from predators by their special armour, particularly the face and delicate underbelly. This little trick works great for these little guys in the wild, because they’re much too tough and crunchy to be eaten when in this form! 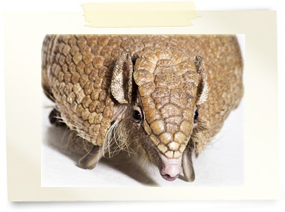 Some armadillos also like to evade predators by cleverly running into spiky bushes and patches of thorns – the armadillos are protected by their armoured plating, but the predators get a thorn or two in the nose if they dare to pursue them! Our armadillos may be carrying heavy suits of armour around with them, but you’d be surprised at how fast armadillos can go if they put their minds to it! 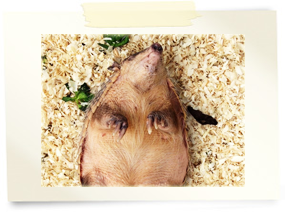 Sherman and Tootsie can often be found scurrying around at top speed as they play – and they move almost too quickly to see if you put a few mealworms down for them! 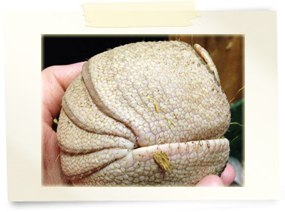 Our pair of armadillos may have pretty tough exteriors, but if you get the chance to meet them in person, you’ll see that they really are big softies on the inside.